I’ve been a consistent recipient of strange dreams. And last night, I had one of the most bizarre dreams ever; it happened with such lifelike detail that I better write about it before I forget! Now, the dream took place at Tom Lee Music (a music megastore in Hong Kong). I can’t remember who I was with but I know I was with a band buddy – I’m guessing he was either Ricky, Jeremy, Jenn Hui, Liang Zhi or Daniel. And the two of us were browsing the store, looking for the latest music records and a new guitar (don’t ask why). So together with the larger-than-life crowd, we were standing in the atrium on the ground floor of the store. After a little fanfare led by the emcee, Metallica made their entrance from the stage up a flight of stairs that came down from the second floor. (THE MEMORY IS STILL VIVID!) They opened the set with their most famous number, and although I can remember how it sounds like, I obviously have no clue what the song was called… They ended that song to rapturous applause from the leather-glad and heavily-bearded crowd. I was truly in shock! And when they finished the second chorus, the both of them put their backs against each other and played Ricky’s guitar solo NOTE-FOR-NOTE. (This obviously, is the glaring discrepancy in my dream; only rock bands, not heavy metal bands, do this back-to-back action.) World-renowned musicians singing and playing Ricky’s and my song – COME ON, HOW COOL IS THAT!? The next thing I know, I found myself at the counter – requesting an audience with their manager and agent, who unfortunately wasn’t around. So instead to speaking to him, I was referred to three Chinese old ladies (! ), none of whom spoke a word of English but only Mandarin, Cantonese and Hokkien. I practically died there trying to communicate “Roller Coaster”, “Heavy Metal” and “Rock Music” with those old dames, whose faces I can still remember – wavy hair, wrinkled skin, chained glasses, gold bangles and jade rings no less to complete the look! It was impossible to discuss royalties, fees and copyright issues with them – no chance at all. By this time, Metallica finished playing Roller Coaster and moved on to their final song of the set. In yet another bizarre twist of events, Metallica shared their testimony of how they came to know the Lord (!!) and started to play “Leaving Ninety-Nine” by Audio Adrenaline – they were right about ready to evangelise (!!!) to the Harley-Davidson-esqe entourage! Impossibly unimaginable! BUT WHAT A BIZARRELY COOL DREAM! I shall conclude in the words of the song made famous by Aerosmith… “Dream on, dream on, dream on, dream until your dream comes true…” This dream quite possibly fused together parts of my personality and aspirations! It’s amazing how creative we can get when we are dreaming. I love dreaming (and making my dreams come true)! 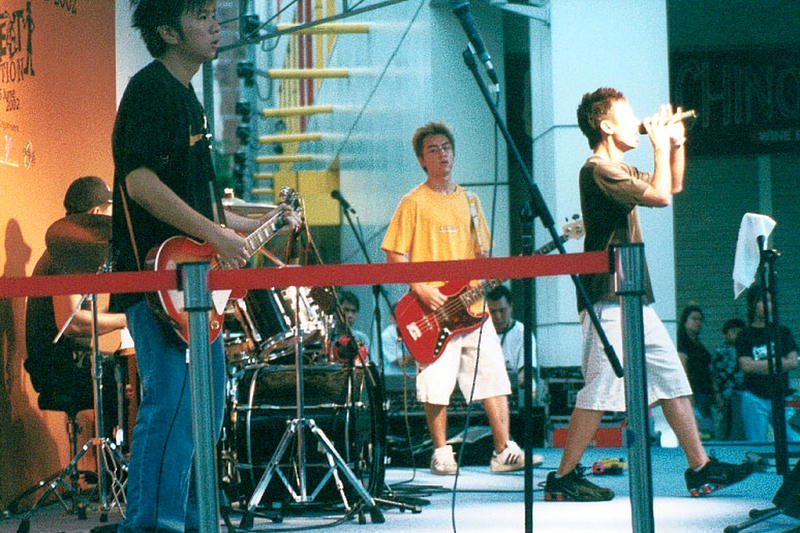 FhLY's first public performance @ Orchard Cineleisure in 2002. For now, my gigging days are behind me, but man, were those good days or what! Photo by Liang Zhi. From left to right: Douglas, Ricky, Jeremy and Joey.